improved support for configuration of one or more options configuration folders: users can select an options folder in a different location than the Documents directory. improved support for dates outside the scripted decade range: for dates not corresponding to a scripted decade identifier, a '?' question mark character is used in lieu of an error alert. the new version moreover calls on a formatting function included in the Satimage.osax scripting addition developed by Satimage-software. the scripting addition is bundled subject to Satimage-software's licensing terms for free software. all options files for previous versions are processed the same in the current version. the 'informatics' engine was patched to ensure that the 1st and 2nd decitriads display all places even if there are one or more trailing zeroes. 'options parsers' and 'informatics' engines were updated with the new modules used for foldatimeICAS 1.03. the decimal clock times are now written with a 2nd decitriad to the microchron (for example, tTTT ttTTT). earlier versions of clipboardICAS were written with only a 1st decitriad to the millichron (for example, tTTT). the methods for configuring options are unchanged from the previous version. local time options for zoneDeka are now user-specifiable without any need to edit script code. the clipboardICAS 1.06 script uses the same 'options parser' and 'informatics' engines that were developed for the foldatimeICAS 1.02 script and application. please refer to the configuring options document for detailed information. the module 'ICAS informatics NOW for applescript' (build c8C17) resolves the reference of UCfourChar expressions that, depending on configuration and coordination of prior builds of the informatics module, might have affected the representation of zoneDeka or zoneZodiac timepoints that straddle different dates. decadeInitial handlers for zodiacYear should only be used for zodiac time points, and handlers for dekaYear should only be used for deka time points, to ensure ICAS conformance for any times that deka and zodiac time points straddle the transition to a new decade. As a result, the previous fdtICAS scripts that might have included references to deprecated implementations are now deprecated. these issues concerning the coordination of time zone and date did not affect the output generated by clipboardICAS 1.05; however clipboardICAS 1.06 is now updated, and developers are advised to note the deprecated status of previous versions of the 'informatics' module. to obtain the application (and the script source), download the ICAS_now software kit from the AAT ICAS code library. clipboardICAS generates a timestamp of a selected date and time formatset, calculating ICAS date and time information from Mac OS X system date and time. when launched, clipboardICAS prompts user to 'Select an ICAS formatset for the clipboard:' and choose one of the 'local', 'UT', or 'daynumbers' buttons. upon selection, a new dialogue panel shows the selected ICAS formatset with an option to save the text to the clipboard, or cancel. 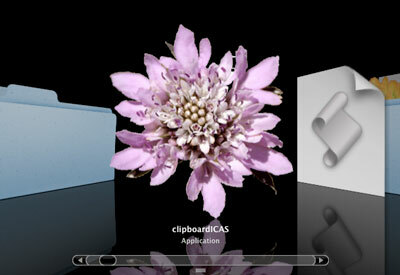 upon selecting 'cancel' or 'clipboard', the application closes quickly. users who want a record of date and time can use clipboardICAS to generate a timestamp. the application is also convenient for quickly looking up the day of year, or for checking the date and time for the UT time zone. ICAS date and time formats are designed to accommodate more data interchange for calendar and clock information. users can use ICAS calendar and clock formats to expand, truncate, sort, compare, and process date and time information more readily by means of uniform schemes for the formatting of data and metadata. decimal clock times in ICAS are typically written in a decitriad form (for example, 't123 tt456' is decitriad form for 0.123456). the ICAS IDC (Inter-Dial Clock) value is an expression of a decimal equivalent of a length of a standard day of 86400 seconds [s, SI], or 1 chron [Xn, ICAS]. the decimal clock time in foldatimeICAS and clipboardICAS is expressed to 6 decimal places in terms of two groups of three decimal places, or decitriads. all versions earlier than 1.09 are deprecated, due to a variety of changes and improvements.